Make the most of your airport layover on this whirlwind guided tour of Shanghai—also well-suited to cruise ship passengers. Tick off impressive landmarks, from the cutting-edge Bund waterfront to the 400-year-old imperial gardens. Veteran travelers who have already covered the highlights can choose from lesser-known sights like the Propaganda Poster Art Center or Jade Buddha Temple. Please advise if you have big luggage or more than 2 luggage. The tour starts 1 hour after flight landing. Please contact your local operator if you have to take a long time in custom, and your driver will be wait for you in the arrival hall. This layover tour requires at least 8 to 10 hours between two connecting flights. 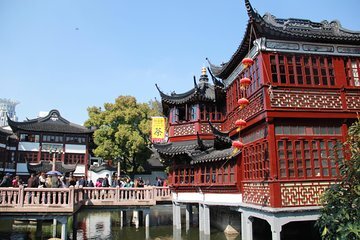 We had an amazing tour and would recommend this to anyone traveling to Shanghai! Wilson answered all our crazy questions and made sure we had everything we needed for a great day. He really knows the city and customized it for us! Thank you! Great tour great guide and driver. Great service. Shanghai is amazing. We hope to come back and book another tour with Viator. Spent a wonderful day today with Berlin. She was very knowledgeable about the history of Shanghai and shared many fascinating facts. We had wonderful food and when I told her I needed some gifts, she took me to some great souvenir shops! It was definitely a five star day!!!! We spent today in Shanghai very nice day with Snow, we visited Jade Buddha Temple and Yu Garden and Shanghai Tower, the Bund, Tian Zi Fang. Snow byla velmi příjemná a ke všem navštíveným místům nám poskytla zajímavé informace. Zkusily jsme taktéž čínskou kuchyni a chutnalo nám. Strávili jsme velmi hezjký a příjemný den v Shanghai. Our Shanghai layover tour was great. Our tour guide Berlin was super engaging, attentive, and flexible. She was also very knowledgeable about the city and spoke great English. Definitely a great way to spend your layover in Shanghai. I give it 5 stars. From start to finish our tour was as expected and communicated. We were picked up at the airport and taken to the TV tower where Snow provided so much insight and history of old and new Shanghai. We then had lunch at Paradise Dynasty and really enjoyed the food there. Visiting the temple was my favorite part of the tour because Snow knew and explained so much about Buddhism and it connection to day-to-day living. Though the weather was cold and rainy, Snow provided enough sunshine to make this tour fun memorable. If I return to Shanghai during the warmer summer months I would take this tour again and request Snow as my guide. We had disembarked from our cruise ship and wanted to see the city before we flew out at midnight that evening. There were 4 of us with 8 pieces of luggage and we also needed a place to store our luggage until our flight that night. Fortunately for us, we found this company on Viator. We give the tour company and our tour guide Queena, a 5 star out of 5 stars rating. We had an amazing time. Queena was so knowledgable and accommodating. The van that met us was large and very comfortable. It allowed us to come and go with our guide and leave the luggage in the van. That kept it secure and we didn’t have to fool with it until we were dropped off at the airport that evening. Queena spoke excellent English and was so kind and helpful. She knew just what to see and where to go. We had a very full day and saw an amazing amount of places in the 8 hours we had. None of us had ever been to China before and Queena made it a very memorable experience. She is highly recommended. Alana was also so helpful and friendly. She was very easy to make contact with, and answered emails and text’s almost instantly making us very comfortable in our arrangements. Everything Alana said was done and done with excellence. Viator is a fantastic company with fantastic employees. We will definitely use them again in our travels. Thanks again for a very memorable trip. I thank Snow for being a superb host! She was very knowledgeable, friendly and did a great job squeezing as many activities as we could in the short time we had. Yu Garden was beautiful ! TV Tower amazing! Paradise Dynasty for lunch, delicious! Jade Buddha Temple a spiritual masterpiece. If you are visiting Shanghai use this company and ask for Snow! I’ll be back!!! We had the most wonderful tour with Wilson! I would recommend this to anybody from an older couple to a family, he was so accommodating and enjoyable to spend the day with. I would come back and do it again in a heartbeat. We were picked up and dropped off to the airport, without a hitch best tour I’ve ever done in my life. Thank you to Alana, the manager and Wilson our tour guide for the best day spent in Shanghai! Hope to come back and do another tour with them again.